The Photo Archives & History Center has a new exhibit that examines the area’s crucial role in the revolutionary farm-to-table movement. Plant City played a key role in changing the way farming, food processing and the journey from field to table developed in Florida. Florida Strawberry Festival President Paul Davis and Carl Grooms of Wish Farms. displays that discuss everything from farming improvements to the creation of massive supermarkets. 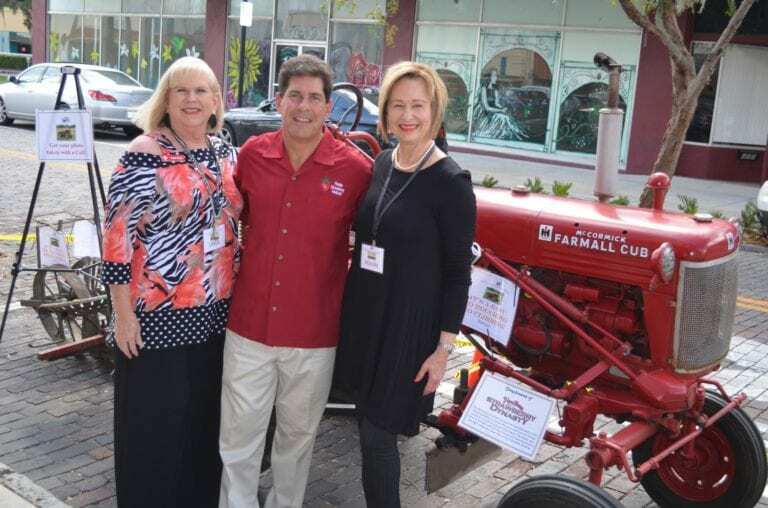 Titled, “Plant City and the Agriculture, Food Processing and Supermarket Revolution 1939 to 1975,” viewers can take a journey through time and explore the history of local farms and food processors as well as glimpse how beloved giant Publix Super Markets, Inc. came to be. An exhibit preview was held Oct. 14 and many community members, as well as the families behind the informative displays, came together to delve into the rich history of the region. The grand opening event for the exhibit was held at 10 a.m. the next morning. Following World War I, the advanced technology developed was used to steer farming into a dramatically different future. Plant City opened what was then the largest State Farmers Market in all of Florida in 1939, creating a one-stop-shop for families and retailers in the area. As the farming technology continued to advance so did canning, processing and food packing. Dehydration and the crystallization methodology continued to develop and soon food was able to travel farther and last longer. Publix brought two of its uniforms to the exhibit to show how things have changed over the decades. Publix, now a southern staple, was first opened by George Jenkins in 1940. Plant City received its first branch of the store around 1945 on South Collins Street, formerly an All American Food Store. Partnering with the Archives, the supermarket giant created a massive display for the exhibit detailing its story and how it came to be such a cherished business. There are also exhibits from the Hillsborough FFA, the Hillsborough County Farm Bureau, the Florida Strawberry Growers Association, the Florida Strawberry Festival, Wish Farms, Plant City State Farmers Market, J. William Horsey Corporation, Southland Frozen Foods Corp. and the Florida Citrus Hall of Fame. When an attendee walks in, they should go counter-clockwise around the room to start learning about the organizations in place to further agriculture in the state, then examples of leaders in the industry like Wish Farms. Wish Farms has been an inarguable leader in pushing toward using advancing technology to revolutionize the way the nation farms. After learning about the farm and the legendary State Farmers Market, guests will learn the history of Southland Frozen Foods Corporation, which has helped send Plant City produce to homes across America. Five generations of the Kennedy family have come through Plant City since the creation of Southland Frozen Foods, which has revolutionized food processing. originating in Plant City are also on display. After absorbing the history of how farming revolutionized the area the story wraps up with the Publix exhibit, which brings the products full circle from the field to the dinner table. The exhibition is free and open to the public from 10 a.m. to 6 p.m. during the Archives’s normal business days until Nov. 4.